Our last day in Tana Toraja started with watching the sea of clouds in Lolai village, followed by breakfast at Toraja Heritage Hotel before checking out for our journey back to Makassar. Along the way back, we stopped by Makale, the capital of Tana Toraja regency and the commercial center of Torajaland (versus the cultural center of Rantepao, capital of North Toraja). Makale is also an important gateway to this region, since Pongtiku airport is located here. 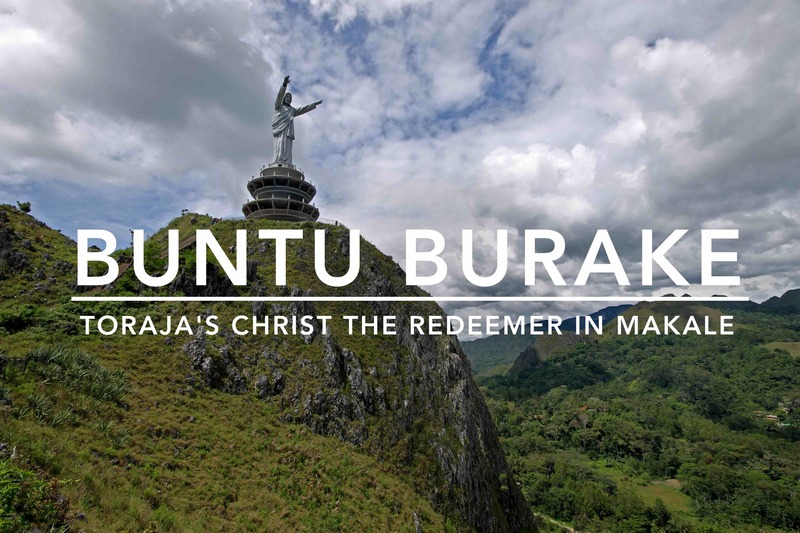 Lording over Makale is a giant statue of Jesus Christ on Buntu Burake hill (Wisata Religi Buntu Burake or Patung Yesus Buntu Burake in Bahasa Indonesia), an imposing testament to the Christian faith of modern-day Torajans, which was introduced in the early 20th century by Dutch missionaries. Sixty five percent of the population are Protestant and 17% are Roman Catholic, with the remainder being Muslims and the traditional religion of Torajan Hindu or Aluk Tu Dolo (Way of the Ancestors). A close-up of the 40-meter tall monument. Bridgeways leading to the base of the statue over karst formations. Buntu Burake overlooks the town of Makale, the capital of Tana Toraja regency. The top of the hill is accessible by vehicles and the base of the statue, which was still being constructed during our visit, can be reached via a flight of stairs. Standing at height of 40-meters (including the pedestal), the robed statue of Jesus Christ is reputedly the world’s tallest – as tall as Bolivia’s 40-meter Christ of Peace, and much taller than Rio de Janeiro’s 38-meter-tall Christ the Redeemer. Check out this list of the world’s tallest Jesus statues. Inaugurated in 2015, it costs 22 billion rupiah to build – that’s PHP 84 million or USD 1.65 million. Buntu Burake is the tallest Jesus statue in the world, measuring both statue and pedestal. Makale, the capital, nestled in the mountains of Torajaland. The town center of Makale with the Grand Mosque and Lakipadada Statue, surrounded by a lake. The karst hills surrounding the statue were beautiful, making the destination not only a pilgrimage site but also an ideal place to admire natural scenery and the majestic landscape of Torajaland. The statue overlooks the township of Makale, nestled in the middle of mountains. From here, you can see the entire district, clustered around the town center with its Masjid Raya Makale (Makale Grand Mosque) and the Lakipadada statue of a Torajan hero in the middle of a small manmade lake. Buntu Burake was a one-hour drive from our accommodation in Rantepao, Toraja Heritage Hotel – a beautiful, sprawling mountain resort with tongkonan-inspired accommodations, a restaurant and outdoor swimming pool. Room rates start at IDR 950,000 (PHP 3,611, inc. tax and service charge) for a double or twin room, inclusive of breakfast. For other places to stay in Tana Toraja, find discounted rooms here.